Your car's water pump is designed to push coolant throughout the engine block, cylinder heads, radiator and the car's heater and is bolted to the front of the engine and sealed to the block using gaskets. There are several designs in which the pump can be mounted to the engine but the most popular method is to use the water pump to sandwich the timing cover to the block using the water pump mounting bolts. The pump's impeller is responsible for circulating the cooling and may be exposed when the water pump is removed from the engine. 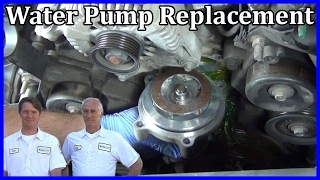 If the bearing of the pump fails it can cause the impeller to contact the timing cover housing causing the water pump to leak and make grinding or squeaking noises. A water pump is made up of the metal pump housing, main shaft seal, bearings and a fluid impeller. A flanged hub is fitted to the main shaft where a pulley can be bolted on so a serpentine belt can drive the pump once the engine is started. The image below shows a water pump bolted to the engine block and how the timing cover is used as part of the pump's impeller housing. 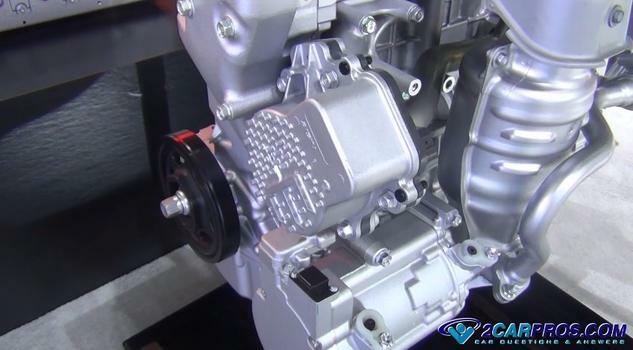 A water pump can be driven by a timing belt or chain of the engine. The problem with engine's that have a water pump that is driven by the timing chain is when the pump goes bad it will allow coolant to enter the engine oil which can cause the engine bearings to fail. As the engine's RPM changes the water pumps flow rate will increase or decrease as well. 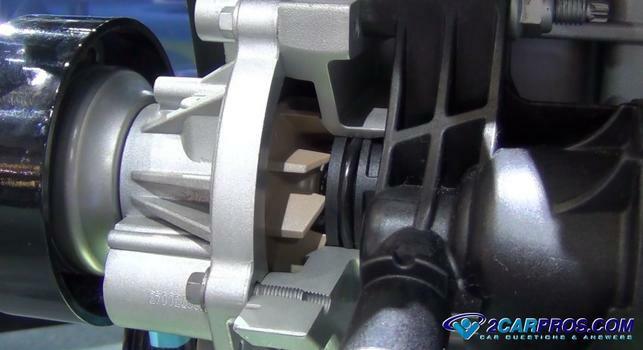 This is not the case for water pump designed for hybrid cars. Most hybrid engine's water pumps are electric and are driven by a small electric motor mounted inside of the pump housing. An example of this style of water pump is featured in the image below. Here is a water pump in action so you can see how the impeller is used. If you have any questions about a water pump, please visit our forum. If you need car repair advice, please ask our community of mechanics who are happy to help. Our service is always 100% free.